Home Spiritual Life L’shanah Tovah! Our Jewish friends are celebrating Rosh Hashanah, the Jewish New Year, today. This is the first of the Jewish high holy days. It’s also a day for all God’s people to reflect on our lives, spend time with our Creator and Jehovah Jireh, and look forward to what God has in store for us in the upcoming year. The Lord said to Moses, “Say to the Israelites: ‘On the first day of the seventh month you are to have a day of rest, a sacred assembly commemorated with trumpet blasts. Do no regular work, but present an offering made to the Lord by fire'” (Leviticus 23:23-25). I’m not an expert on Jewish holidays, but I am a student. I took some time this morning to read about this day, and I found several very significant observances for myself as a Christian. From the website, Judaism 101: “The common greeting at this time is L’shanah tovah (‘for a good year’). This is a shortening of ‘L’shanah tovah tikatev v’taihatem’ (or to women, ‘L’shanah tovah tikatevi v’taihatemi’), which means ‘May you be inscribed and sealed for a good year. '” I guess this is akin to our saying, “Happy New Year,” but as I understand it L’shanah tovah has a much stronger spiritual connotation. This day begins a time of serious introspection, prayer, and repentance. Religious observances today focus on God’s sovereignty. I’ve written a lot lately about this. I’m in a personal season of coming to a more full understanding of God’s sovereignty and actually living and making decisions based on the fact that God is in control. With all that is going on in the world and in our personal lives today, this is a good day to reflect on God’s sovereignty. This afternoon when my kids are home from school, I’m going to do something unusual. We’ll eat apple slices dipped in honey. This is a Jewish custom on this day to represent our wish for a sweet new year. Perhaps you could share some Rosh Hashanah customs with your family or your small group today as well. God is in control of our lives! May he give you a sweet new year! 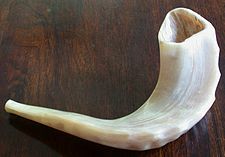 Have you ever celebrated Rosh Hashanah? What ways have you observed this day?